Wow! What a week it has been…I can’t even remember where my last post ended and this one began. Last week, we came home from the hospital at the beginning of the week (I think! ), and had a pretty great week. Ty golfed with his dad and brother and friends every day that he was home. Saturday, he was doing so well – spent three hours walking the mall shopping with Erika (he has never done that on his best day! ), golfed with his dad (and beat him, I might add!). Darren, Tyler and I went to Training Table that night to grab a bite to eat. Halfway through his dinner, he got a strange look on his face, and said, “We need to go now…I’m not feeling good”. We headed out of there, and he threw up in the car – lots of fresh blood. It’s such a horrifying feeling when that happens. We hurried home and packed a quick bag and headed for the hospital. When we talked to them on the way down, they were hoping that maybe we could just ‘tank’ him up with blood and plasma to help his blood clot, and send him home by morning. We checked into the hospital about nine Saturday night and were hoping to be home by three in the morning. As the night progressed, things were not getting any better. Tyler was continuing to vomit blood and not just small amounts. It was actually coming out of him as fast or faster than they were transfusing it into him. His hematocrit levels were dropping quickly. Tyler was looking worse and worse by the minute, and Darren and I were terrified. Early Sunday morning, they had called the oncology team, the GI team, and a surgery team together to discuss a solution, if any. They called Darren and I out into the hallway to discuss their options with us. The GI team said if they tried to go in with a scope there was just too high a risk of perforating the stomach. He pretty much refused to do that procedure. The surgery team said they could open Tyler up and try to find the problem, but he probably would not survive the surgery, and whatever they fixed still wouldn’t fix the cancer. The radiation oncologist said that they could try to go in through an artery in his leg and find the bleed and burn it, but the risks far outweighed the benefits. When I asked what he would do if it was his son, he said, “take him home.” We went into the room and told Tyler what the doctors had just shared with us. He took a deep breath and said, “Let’s go home, I’m not afraid.” My most difficult day as a mother. Right after they told us, someone brought in chocolates for Mother’s Day – not a holiday I want to remember this year. The doctors got us ready in a hurry to go home. They did not think Tyler would make it through the night Sunday night. We brought Tyler home Sunday night to be here with the family and not just in a dark, cold hospital room. The doctors had called hospice and they were here to meet us when we got home. It was the most surreal feeling I have ever experienced, thinking I knew what lay in store for us that night. When Tyler woke up on Monday morning, he wanted to go golfing. 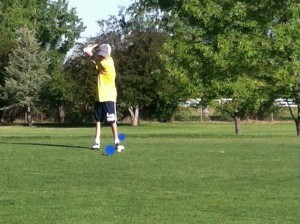 The whole family packed up and headed to Davis Golf Course and played nine holes. It was very hard to watch – Tyler could hardly swing the club. I didnt know if we were going to have to call an ambulance out on the golf course. But I don’t know how he does it. He still could hit the ball better than most on their best day! After seven holes, he was too worn out to play anymore. We came home, got ready for a family picture, and had some friends come visit Tyler, and went to bed again. I cannot describe at all how it is to try and rest when one you love has health like this. Every move Tyler made had us jumping up and making sure he was still breathing. Tuesday morning, Tyler decided he wanted to finish the radiation treatments he started and see if it could make a difference. 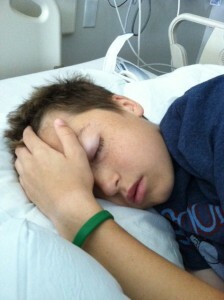 He is not done fighting…Long story short, Tyler was not expected to make it through the night Sunday night. It is Tuesday night now and he is still here and ready to fight more. We know that Tyler will be with us for as long as the Lord has planned for him. We are grateful for every second we have with him, as we are with every one of our children. We have had some conversations with him and our other children that I never imagined I would have to have. Tyler is not afraid – he knows where he is going and that what is in store for him there is wonderful. He knows that Heavenly Father is in charge and he will leave this earth when his appointed time is here, whether it is tomorrow, next year, or in fifty years. We still have great hope for his future. The bleeding has stopped and he seems to be feeling a bit better. I have to believe it is because the Lord hears the prayers of those who love Tyler. We cannot express how grateful we are for the love and support of family, friends, and the community. I am so sorry that I cannot answer all of the emails, texts, and messages. I love hearing from you and I love your words of support! Thank you for keeping our family in your thoughts and prayers. Tyler is truly Fighting to the Finish – thanks for helping him! In the hospital at the same time - again! I know there are so many families with Cancer Cuties that spend months and months on end up here, so I feel guilty for feeling picked on for being up here again one more weekend! Once more, Tyler made it through a great week, golfing and enjoying time with his friends and hanging out with family. Sunday morning rolled around and it was time to go back into the hospital. 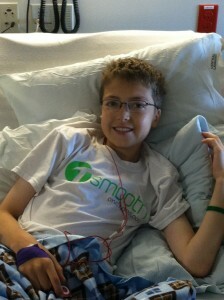 Tyler’s blood counts were once again at ‘record lows’ and he needed another transfusion. This time, we knew that the only way to get real answers was to get a scan. We have really avoided those since January – they are not usually our friends.. So about two in the morning on Monday, after some pretty traumatic procedures (have you ever heard of an Anderson tube? – no fun), we headed downstairs for a CT scan. I know every person reading this who has had experience with cancer knows the terror that grips hearts when you or someone you love is in that tube. I can’t think of anything in life I’ve done up till now to compare to it. We came back up and tried to get a little bit of sleep – Darren in a rocking chair and me in a ‘recliner’ – yes, that’s what they call it! When the doctors came in the next morning, they had okay news, and not-so-okay news. Tyler’s tumors have hardly changed – small amounts of growth in a few of the tumors, but no new metastases. We were so relieved to hear that. We knew that GI had to also look at the scans so were waiting on them. When they got around to us, they informed us that the larger tumor on the upper side of Tyler’s liver has now pressed up against the stomach wall, and that pressure is causing the bleeding. If they were to go in and scope to see more, they were quite sure that they would perforate the stomach wall. Things did not sound so great then…they were going to put their heads together with the oncology team and see what the best options were. We needed to wait another half day to see what they decided. After calling an interventional radiology team, they decided that they need to try and shrink the tumor that is pressing on the stomach. The only way to do this is by radiating it. I, along with many others, wondered why they didn’t radiate it in the first place – I finally learned why today. The liver is very sensitive to radiation, andwhere Ty has so much disease in his liver, if they were to radiate each tumor, they would destroy the whole liver. They do feel that they can localize the radiation to this one tumor and shrink it enough to take the pressure off the stomach wall. To make a long story short, we just got back from LDS Hospital, where the radiation will be done. I loved our new doctor there. He was kind and gentle, and completely willing to answer all of Tyler’s questions. He got some new ‘tats’ today, not the kind he was hoping for – he would have liked a barbed-wire around his bicep, or maybe Superman along his back. Instead, he has four beautiful little black dots around his chest to help make sure the radiation hits exactly where they want it! We begin the actual treatment tomorrow (Wednesday) morning. Our family asks once again for your pleadings with the Lord on Tyler’s behalf. We need this procedure to shrink that tumor and stop the bleeding inside Tyler. We should know in three weeks if it will be effective. I would also ask that if you can donate blood, do it today! Not only in Tyler’s behalf, but I watch these little cancer cuties getting this life-saving blood and know that without healthy people being willing to donate, these little lives would be lost. I believe that probably 20 people had to donate blood and plasma to keep Ty alive at this point. So, so grateful to those who do this regularly. Thank you! I also am grateful for your prayers for the warriors in this picture below. They are all fighting valiantly to stay alive and I am honored to be able to be able to call them ‘friends’. 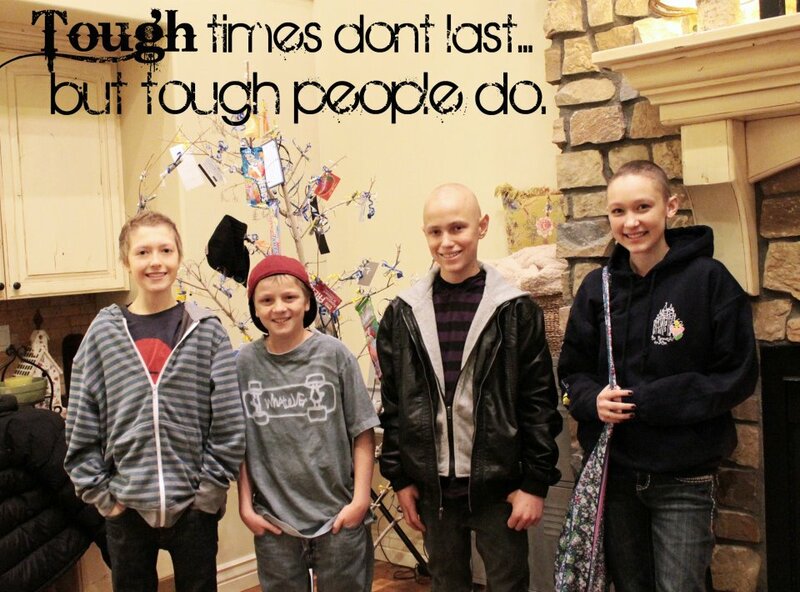 These four kids know more about courage and spirit in their short lives than most learn in a lifetime. Thank you for being willing to share your journeys with me. I love you Tyler, Brandon, Josh and Maddie. You will always be my heroes! I love you Tyler, Josh, Brandon and Maddie! I’ve been trying to organize my thoughts for the last few weeks on our family’s journey. We have had a crazy few weeks and so many things have gone through my head. We went to California a couple of weeks ago and it was pretty hard on Tyler. Sad to say, we spent most of the weekend in our hotel with one sick Tyler. We had tickets to Six Flags at Magic Mountain on Saturday, so drove up there from San Diego and after about four rides, Tyler was too sick to keep going. Poor Tanner and Taylor had to leave after only a few rides. They were awesome about it and did not complain at all. I felt so bad, but there are lessons to be learned for them. They will know compassion and patience that most people won’t learn until much later in their lives. I had a total meltdown in the San Diego airport as we were trying to get through security. I hadn’t shed one tear the whole week, but felt the pressure rising each day as he got sicker and sicker. Finally, Tyler had to go find a chair in the airport and could not make it through the security line. I went over to the Delta desk to see if someone could get him a wheelchair. The sweet man who helped me (actually, the poor man), made the huge mistake of asking if “I” was going to be okay. He was so sweet and I hate being shown compassion when I’m feeling so vulnerable. I knew what was coming, and I totally lost my composure on this poor, sweet man. He came running around the desk and gave me the biggest hug and told me he was going to go right back in the back room and pray for us. Then a few other agents came and hugged me and cried with me. Very embarrassing, but also very strengthening, knowing people everywhere want to help and are willing to pray for a complete stranger. Tyler has been more nauseated than usual and has had quite a bit of abdominal and kidney pain. It’s such a scary place to be. I have probably given more foot and leg rubs than a professional massage therapist! That seems to calm him down and help with the pain management and nausea. We have changed a few meds and he has seemed to be a bit better the last two days. What a relief! We are hoping this can last! perspective if our suffering is to teach us. I hope that I can learn that perspective so that Tyler’s (and my) pain will not be in vain. We have a sweet sister in our ward who lost her battle with liver/pancreatic cancer yesterday, less than two months after her diagnosis. Her work and her body here on this earth were just done. It does make me wonder what Tyler needs to accomplish on this earth through this illness. I know from blessings he has been given that the Lord has purposes to fulfill through him. I hope as his family members, we can do what we’re expected to do to fulfill His purposes, as well. Once again, I LOVE hearing that Tyler and our family are still in your prayers. We do know that is why he does as well as he does. By the way, he is in Las Vegas with Darren at work today, and I just got a picture texted to me of Tyler bowling! I think that warm weather and sunshine is ‘just what the doctor ordered’! Thanks for your part in our fight! Belmont Park in San Diego with my boys! Wow…a lesson for his mother, again. I wasn’t there for the interview…no one coached him on what to say. These are Tyler’s own words and feelings. I feel so honored and blessed to be his mother. Actually, I feel that way about all of my kids! They are all so much wiser and stronger than I am. I am sure they were sent to me because Heavenly Father knew I was going to need a lot of help down here! Okay, quote time! 🙂 A friend put this quote on Facebook and I loved it. Thanks Dirk! Not sure it really goes with what I wrote about today, but it is a great answer for making each day more enjoyable! He is my favorite…I have quotes from him taped all over my house and look to them when I feel sadness and discouragement creep into my life. I am grateful that there is one who knows my sorrows. Christ knows me personally and has atoned for my sadness and fear. There is no grief, no pain, and no sickness that His Atonement and His Love cannot heal. When it feels like too much, I always know that His arms are wrapped around our family and He is there to comfort us. Of that, I cannot ever deny. I hope whatever heartache you may be feeling, you can receive this witness as well. He is there for all. Last week, our awesome cancer fightin´ kids met another awesome fighter to give the ´Giving Tree´ to. Josh has been fighting osteosarcoma for about four years now, and is another one of the bravest kids I know. Brandon, Maddie, Tyler, and a couple of us ´moms´ loaded the truck up with the tree and drove up to Morgan to find our new friend. It has been so fun to watch these kids..as soon as they get together, they are instantly friends. It felt like we all had known each other for years. 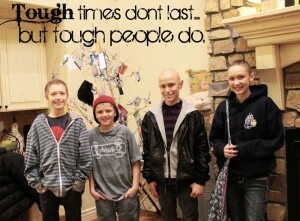 The kids sat on the couch at Josh´s house and talked and laughed and compared chemo stories…so fun for us to listen to! We will forever be indebted to and will miss Dylan for his unselfish gift of the tree. 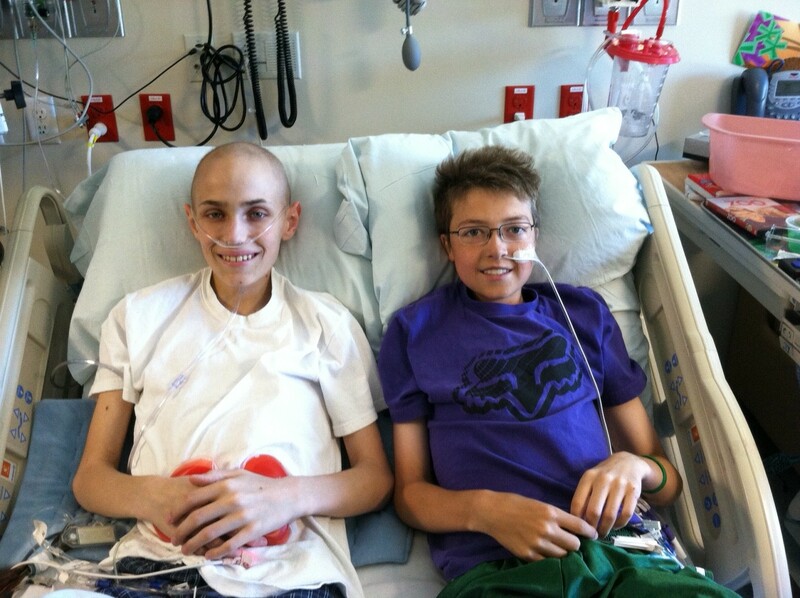 His gift has brought joy to five other cancer fighters, and given these kids another friend to share things that they probably wouldn´t and couldn´t share with their other friends. We love you Shaw Family! Tyler has been feeling pretty well this last week or so. He has some good and bad days, but generally more good than bad…We are enjoying the good ones, and just putting one foot in front of the other on the ´not so good´ ones. Last night I went to Tyler´s SEOP..where the ninth-graders register for high school. When I walked in, they handed me a packet of school work and tests Tyler had done in the last year. There were a bunch of papers from eighth grade when they all participated in ´Reality Town´, a day where they get to choose a career, and basically live an adult life for the day. They get a job, salary, wife and kids, and oh yeah, the bills, and have to make choices for their life. It´s a great reality check for these kids. I read something Tyler had filled out called ´My Life Path´. As I sat in that room and read what he wrote that his ´life path´was, according to him as an eight-grader, I could feel palpable sadness overwhelming me. I thought I was going to need to leave the room. Luckily, Tyler wasn´t with me in that meeting. I thought of what he, along with our family was thinking about and doing when ´Reality Town´was happening last year. I think they had this about two weeks before Tyler was diagnosed. We were all just going along with our lives, hustling and hurrying to the next stop along the way. The things that were so important, to Tyler and to us, seem so unimportant now. Interesting how life changes…the rest of the papers in the file were not completed, because Tyler had missed the rest of the school year. My emotions were so close to the surface as I sat through the rest of that presentation. I was glad I didn´t know anyone in there, and that no one wanted to talk to me!!! When it came time to actually register, in walks Tyler, all smiles as usual. He shuffled through the papers that I had, completely unphased. I realized at that point, that if it isn´t going to affect Tyler in a negative way, I cannot let it get to me like that. My sweet friend Megan, who is an amazingly positive person, AND a stage four cancer survivor, shared this quote yesterday. I loved it, and wanted to share it here. Isn´t that so true…the amount of work is the same. Sometimes I feel like it´s a lot of work to make myself happy, but it´s also a lot of work to stay miserable all of the time. I think, like Tyler, the choice to use that much work might as well be made to make me happy. Isn´t that what it´s all about? After such a ‘downer’ blog post last week, let’s move on to something amazing. Last Fall, I was attending a conference, and heard a most amazing speaker, Mike Schlappi. He spoke on overcoming trials and positive outlook. I was so moved by his presentation, I knew I wanted my family to hear him too. I spoke with him afterward and we talked about him coming into the school for an assembly. I came home and tried to find out how to get him here through the district, and ran into a few walls, and eventually decided to put it on the back burner. Then Sue Gray, our sweet friend from Salt Lake sang a beautiful song called “Every Little Tear”, reminding us that He sees every heartbreak and sorry we are experiencing and will help us get through our darkest moments. Can I say AMAZING one more time?! Well, what a great night…Brandon, Tyler, and Maddie, three ‘rockin’ cancer fighting kids, all got to meet and visit with Mike afterwards and he gave them his book “Shot Happens” (yes, that’s really the title! I think the sub-title was ‘I got shot…what’s your problem?’) I read the book in two days. It is full of life-changing ways to stay positive and headed in the right direction. I’m going to bribe each one of my kids to read it!!!! It will change the way you view everyday life, I promise! You can go here to get it, or see clips of his presentation. don’t believe in coincidences, I think everything happens just as it should, and I am so grateful this happened ‘just like it should have!’ Thanks again Mike, Becky, and Sue! 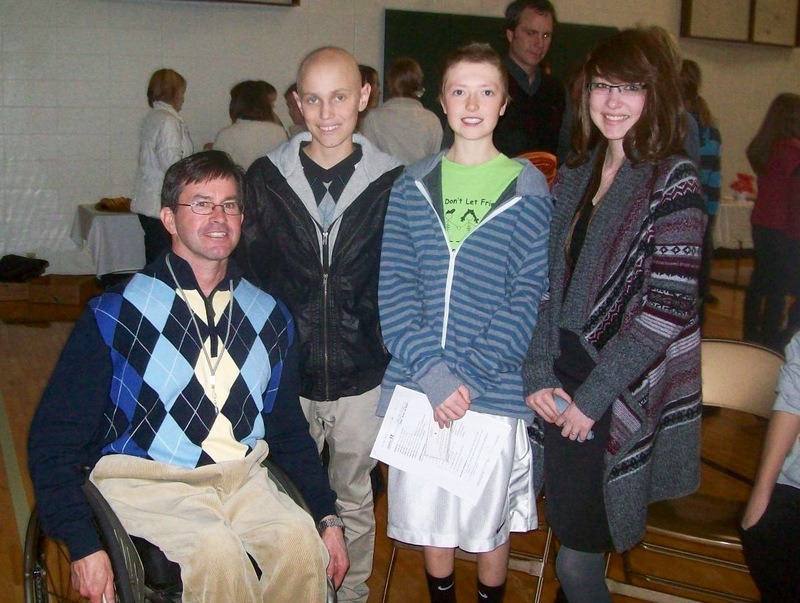 Mike, Brandon, Tyler and Maddie - All heroes in my book! I have to admit it is getting harder and harder for me to write these blog posts. There is a big part of me that wants to keep things so private…Maybe because things aren’t going as well as our family would like them to and I don’t want to sound like I’m pessimistic or ungrateful…I’m not sure. I have been struggling to find a way to write this post for almost two weeks now. Last night at a meeting, a friend who also has fought this cancer battle with her child, asked about Tyler and said she had been checking the website and there was nothing there. After we visited, I decided it was selfish of me not to let people know how things are going, when the reason they are going as good as they are is because of the prayers of all those who love Tyler, and who probably check the website to see what they need to pray for next!!!! Tyler had his scans two weeks ago today. I cannot even begin to explain the terror that gripped my heart that morning when I woke up. As I wrote earlier, he has not been feeling too well, and I really didn’t want to know that the reason for that may have been because the cancer was spreading. As I knelt to pray that morning and pour my heart out to my Heavenly Father to help us get through the day, I had the most amazing feeling of peace come over me that it all would be okay. The strange thing is, I never know what ‘okay’ is anymore. I guess I’m learning that ‘okay’ means that Heavenly Father is in control and whatever happens is exactly what He planned for us before we came here. Scary thought, huh? to say, scan day has turned into one of my least favorite days ever! We always come home right after scans now. Much better to get a phone call and be here to receive the news, than to sit in an office for hours and have poor Tyler a wreck before the news comes in. It’s a much better solution to be in our home and all be together. Dr. Wright finally called with the scan results the next morning. She said that the three larger tumors had grown, but only slightly…less than a centimeter larger. The numerous small tumors throughout his liver had basically remained unchanged in size and number, but show some evidence of ‘necrosis’, which basically means dying. So, in other words, his cancer has hardly progressed, and the smaller tumors may be beginning to die, ‘possibly from treatment’ (that’s what the radiologist report said). I don’t know if I’ve said in earlier posts that we are on an alternative cancer therapy we started in November. I honestly believe that if these tumors are dying, it’s from the alternative therapy we are trying. It only makes sense. They have never showed evidence of necrosis in any earlier scans. Here’s the thing…is it amazing that I could be ungrateful for a miracle? Every doctor we’ve talked to who has looked at his scans (and there have been quite a few) says that this is a complete miracle. Tyler’s kind of cancer does not usually sit around being ‘stable’. It quickly spreads, usually to the lungs. Tyler’s lungs are clear. It also quickly spreads within the liver, making the liver function compromised and eventually failing. Tyler’s liver functions are remarkably stable. If this isn’t a miracle I don’t know what is…but this part of me really wanted the kind of miracle that said, ‘Oh my gosh, the cancer is gone and we don’t know how that happened!’ How selfish is that? Now I’m choosing my miracles..I’m sure my Heavenly Father is shaking his head at me. So, that’s why I’ve waited two weeks to write this post. Trying to learn to be grateful for the miracles I’ve been given. I’ll get there. I just hope He’s going to be patient with me. I really am so relieved and happy that the cancer has not spread..that goes without saying. And we will still leave no stone unturned while helping Tyler fight. And, we still are eternally grateful to you all for your unfailing prayers and faith. I know in my heart that the story would be different if I didn’t have an army of people who love and support Tyler and I’ll never be able to thank you enough. knowing that he’s got to be so discouraged about feeling that way all the time, but really, he still NEVER complains. Occasionally, he’ll say ‘Oh, I really don’t feel good’. That’s about as big as it gets from him. Thanks so much for your continued prayers for our family. You know, you’re in this battle with us, because your prayers are part of our fight. We need them to be able to get through this. Please always remember that you’re helping Tyler every time you’re on your knees and remember his name. Thank you! 01/03/12 by Team Tyler | Updates | Comments Off on Happy New Year! It’s been such a long time since I have posted an update on Tyler’s journey. It’s been a long December and to be honest, it’s been a hard one as well. About two weeks before Christmas, Tyler started to become much more fatigued than normal. He would come home from school and fall asleep on the couch and sleep until morning. Then, he would try to get up and shower and go to school, then just be too tired and nauseated to make it to school on time. He also was losing his appetite and after a few days, just stopped eating pretty much altogether. Our hearts were feeling pretty heavy as we watched him decline the week before Christmas. On the Tuesday before Christmas, I took his temperature, and it was 102.7, which is too high for a boy with cancer. We took him down to Primary Children’s Hospital and they hooked him up to fluids and an antibiotic and after a few hours, he really started perking up and looking better. They decided he was just dehydrated and possibly had an infection of some sort, although his blood counts were really pretty good. We took him home that afternoon, and he seemed to improve on Wednesday. Thursday morning, his temperature was back up over 102 and we headed back down again. They loaded him up with fluids and antibiotics again and decided we could take him home, but still didn’t know what was wrong. His blood cultures had shown no bacteria of any sort, and they couldn’t find any source of the fever. We brought him home again, not sure if we would be back in the next day. Well, we made it inside Tepanyaki that night, and Tyler ate EVERY bite of shrimp and chicken that they put on his plate that night, not to mention the salad and rice…Once he had some food in him, he started to perk up and get some energy back. They decided he either had some sort of bacteria that the antibiotics finally kicked in and killed, or a virus that just had to run its course. We didn’t make it to the cabin for Christmas, but we were able to come up later Christmas evening. First time in probably twenty years that we haven’t had Christmas at the cabin, but we had a wonderful Christmas day at home. I have no doubt that Tyler’s turnaround was from the many prayers that week that were offered in his behalf. I cannot thank everyone enough for this. Watching Tyler decline that week was probably the hardest time I’ve ever had, aside from the original diagnosis. It’s been an extremely emotional month for me. This Christmas was probably the most meaningful to me and the family, on so many levels. I am so grateful for Heavenly Father’s gift to me, the birth of His son, Jesus Christ. I am eternally grateful for His life and for His sacrifice so that I can be with Him and with my family for eternity. I cannot imagine going through this without that knowledge. 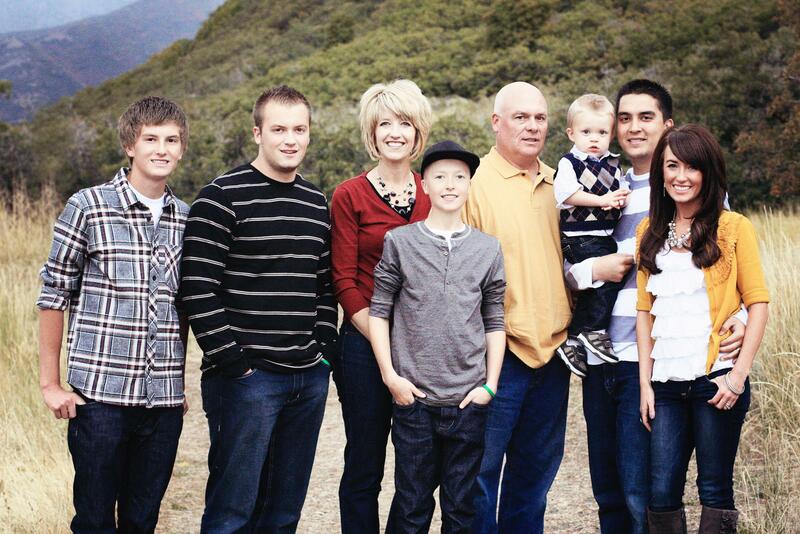 I am so grateful for my family and the happiness they bring to my life. I don’t think I realized until this trial how my family is truly EVERYTHING to me. Nothing else matters to me at all. I didn’t do a very good job with neighbor or friend gifts this year, so if I missed you for Christmas, please know that you all are in my heart and I hope you had a wonderful holiday. The year I needed to recognize people the most and they went mostly ignored by me…not the way I had planned things. And once again, thank you for your petitions to Heaven on Tyler’s behalf. I want you and your children to know that Heaven is listening and answering. Tyler is proof of this, over and over again….May 2012 bring you all the choicest blessings life has to offer! Happy New Year from the Smith Family!